This video highlights Samaritan's Purse work through World Medical Mission and focuses on a recent trip to mission hospitals in Zambia. Samaritan’s Purse staff recently visited mission hospitals in Zambia and saw the important work of World Medical Mission, the medical arm of Samaritan’s Purse. Cissie Graham Lynch met with new mothers and pregnant women who, because of our donation of a fetal monitor, were able to hear their baby’s heartbeat for the first time. Cissie Graham Lynch visited newborns and their mothers at mission hospitals in Zambia. “It is so important that we keep these hospitals alive because they provide so much for a family, especially for women and children,” Lynch said. Each year, World Medical Mission sends hundreds of Christian medical personnel to overseas mission hospitals on a short-term basis. In 2017 alone, we sent 878 such volunteers to support 61 medical facilities in 37 countries. Also, last year, Samaritan’s Purse shipped 169 tons of equipment and supplies to 32 hospitals, most in very remote areas. Our biomedical technicians installed, repaired, and maintained equipment in a number of overseas locations as well. World Medical Mission has also sent more than 150 doctors and dentists to Christian hospitals across the world through the Post-Residency Program, which was started in 2004 to raise up a new generation of medical missionaries. These physicians serve for two years and share God’s love with the sick and injured who are in their care. Dr. Furman traveled with Cissie Graham Lynch and Dr. Lance Plyler, director of World Medical Mission, in Zambia. “Samaritan’s Purse goes to the ends of the earth to meet the needs of people who are poor and have advanced disease and who would not have help otherwise,” Dr. Plyler said. Please pray for our medical volunteers and post-residents as they serve and treat patients in Jesus’ Name at mission hospitals. Pray for opportunities to share the Gospel and offer the spiritual healing that only comes from the Great Physician. From left to right: Cissie Graham Lynch, Dr. Lance Plyler, and Dr. Richard Furman talk with Dr. Paul Myers at Chitokoloki Hospital in Zambia. 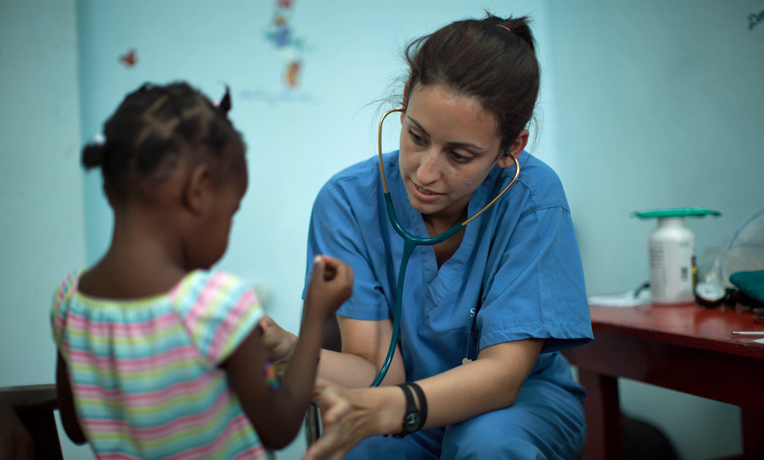 Dr. Myers, a general surgeon, has served with World Medical Mission on a number of occasions.